Places to see at Varsey: The main attractions of this place are the different species of Rhododendrons blooming in various colors. The most popular variety of this species is the red colored ones, apart from the pink and white varieties as well. The sanctuary also houses many other species of plant life like oaks, Magnolia and pine along with various species of Himalayan animals like Black Bear and Red Panda. Nearby attractions from Varsey: From Varsey Sanctuary, you can visit Dentam, Hilley and Soreng. Hilley is located within 4 km trek from Varsey. The trail to Hilley is covered with different species of rhododendrons. Things to do in Varsey: The best thing to do while in Varsey is to go for hiking. The Hilley – Varsey hike is a moderately easy trek that can be easily completed in one or two hours. The Hilley – Varsey trail passes through brightly coloured species of blooming rhododendrons. 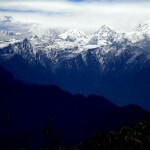 The trek covers a total distance of 4 km and the walk along the Singalila will offer you exquisite glimpses of Mt. Kanchenjunga Range. How to reach Varsey: You can take a night bus or train to reach Silguri or New Jalpaiguri from where you can rent hired cars to Jorethang. From Jorethang, another jeep-ride will take you to Hilley. You can also take a jeep-ride to Ribdi from where an eight kilometer walk can take you to Hilley. However, Varsey is a four kilometer walk only. Best time to visit Varsey: The best time to visit Varsey is during the spring time which comprises of the months of April and May when the whole area turns red with rhododendrons. However, if you want some glimpses of the Kanchenjunga, then the months of October and November is the best time as the weather remains clear at that time. From December to March, the area becomes inaccessible as it remains covered with snow. Lodging and dining facilities at Varsey: When you visit Varsey, you will get accommodation at a lodge which offers both the facilities of dormitory beds and a double-bed room. Plus, the lodge also has dining facilities with different kind of foods including both vegetarian and non-vegetarian.